A SWOT analysis is the best way to really focus your marketing strategies in ways that will drive optimal business growth and profits. Before starting the analysis, you need to have completed your marketing research plan and analyzed your competitive marketing strategy. Follow the links to do those first if you have not yet done so. These two initial steps will provide you with a solid understanding of your marketplace and your competition. Then, take a little time and really think through your company’s strengths and weaknesses, and the market opportunities and threats from an objective perspective. It may be helpful to find a marketing coach who can assist you through the process. A very useful tool to complete your SWOT assessment is the new book “The SWOT Analysis: Using your Strength to overcome Weaknesses, Using Opportunities to overcome Threats” by Lawrence Fine. This is a compact, easy-to-read book that shows how to use the SWOT method to better your organization and your group, by maximizing strengths, minimizing weakness, taking advantage of opportunities and overcoming threats. The most successful companies find a way to use their strengths to take advantage of market opportunities, and they identify and work on weaknesses that might inhibit their ability to take advantage of those opportunities. Successful companies are also always on the alert for market threats. They leverage their strengths to either eliminate or reduce the impact of threats, and work to address any weaknesses that may increase the criticality of threats. 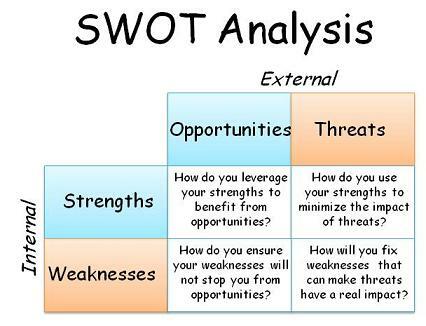 You can find a useful free template for SWOT analysis at Go-to-Market Strategies here. Just scroll down under “Sales and Marketing templates” and you’ll see the SWOT template as a free download. Also take a look at this article for our review of other useful SWOT templates. Your next step should be to use the insight you have gleaned from doing this analysis to further refine and complete your marketing strategy planning.